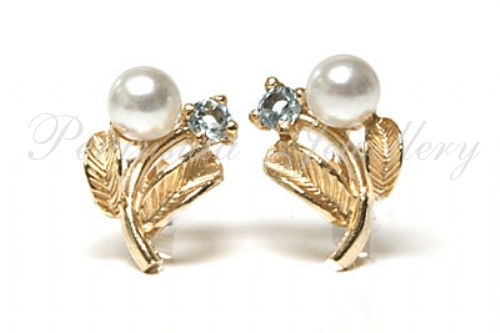 Pretty Flower shaped earrings with 4mm simulated pearls and 2.5mm Blue Topaz gemstones. Beautifully crafted to resemble leaves and flowers on stalks in solid 9ct gold. Standard 9ct gold posts and backs. Dimensions: 12mm long, 8mm wide. Marked 375. Made in England. Supplied in a luxury gift box - Great gift! !